CREATIVE CRAFTS: “We focus on functional crafts. 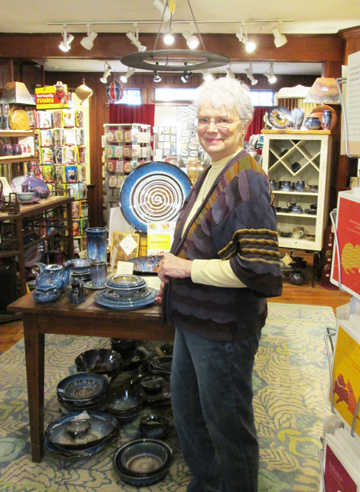 Almost all the items are handmade in the U.S. and are specially chosen.” Phyllis Castells, owner of Heart of the Home in New Hope, Pa., for the past 24 years, is shown beside a display of the renowned Campbell Pottery, especially admired for its beautiful shades of blue. Heart of the Home is filled to the brim with special touches that are a splendid treat for customers. House gifts, wedding gifts, or a special something for yourself are all on hand in a charming setting. In keeping with the property’s history, the store, which celebrated its 24th anniversary in April, has created the feeling of a home, with sample rooms including a parlor, dining room, kitchen, and bath, all featuring items appropriate to each setting. Pottery, jewelry, wood and metal items, lamps, kitchen and bath specialties, and children’s favorites are among the highlights. Customers enjoy a full cross-section of Heart of the Home’s treasures, reports Castells. Pottery and jewelry are especially popular, and one entire room is a showcase for the jewelry, which is all handmade in the U.S. Necklaces, bracelets, and earrings are all on display, as is a collection of wedding rings, which can be customized. Also included is a selection of watches in unique designs for men and women. In addition, the jewelry room includes an assortment of handmade scarves, jackets, hats, and handbags. The pottery is microwave- and dishwasher-safe, says Castells, and the Campbell Pottery with its exceptional blue tones, and also that of New Jersey potter David Voll, are special favorites. The kitchen area highlights a variety of cooking and serving items, including mugs and soup bowls, as well as assorted teas, honey, various sea salts, and cookbooks. Upstairs is a collection of bath and garden products in addition to a children’s section and library filled with books, puzzles, art supplies, and adult coloring books, including The Mindfulness Adult Coloring Book for Busy People — Anti-Stress Therapy for Busy People, among many other items. The bath area includes soaps, lotions, and candles, and the nearby garden section offers a variety of wind chimes and the very fun Shroomys, colorful ceramic “mushroom” garden ornaments in assorted sizes. Also fun are cardboard animal heads, including lions and elephants, which are available in a kit to be assembled. The old favorites, including Pick-up Sticks, Jacks, and marble games, still appeal, and there is really something to engage every kid — as well as all those young-at-heart adults! Sports-minded customers will enjoy the bottle openers made from a bat used in an actual major league baseball game, and also the money clips with remnants of a baseball from a Phillies, Yankees, or Mets game. Carved walking sticks, unique doorbell ringers, unusually-shaped candlesticks, intriguing greeting cards (including handmade), interesting clocks, mismatched socks, and gorgeous handmade kaleidoscopes in assorted sizes and designs are other appealing choices on display. In addition, Exotic Moving Sands Art Pictures with sand from around the world, offer wonderfully creative designs that will make lovely gifts. In different sizes and color combinations, these are very special indeed. Heart of the Home offers a wide price range, with items from $5 up to $800 to $4,000 for wedding rings — and everything in between. Gift cards are also available, as is a wedding registry service. Phyllis Castells and the staff, including store manager Anna Stange, jewelry manager Ivy Palmer, and customer service representative Barbara Zeif, are determined to provide customers with a memorable shopping event. “There is an aesthetic here, an edited selection that we have chosen,” explains Castells. “We go to shows in New York, Philadelphia, and Baltimore to see the work of the artists and crafts people. We want to offer our customers an experience. There is a story behind so many of the items we have. We want people to spend time to look, explore, and enjoy being here. Heart of the Home is open seven days; Sunday through Thursday 11 a.m. to 6 p.m., Friday and Saturday 11 to 8:30. (215) 862-1880. Website: www.heartofthehome.com.